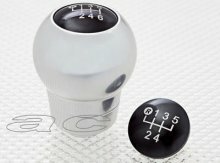 For 15 years Richbrook has been producing unique and innovative car accessories of the highest quality. It this quality that has led several car manufaturers to choose them as their original equipment and accessory designers and suppliers. Push in gear pattern pieces for 5 & 6 speed cars, reverse top left & bottom right. Suitable for most Standard and lift for reverse gear boxes. Invisible fitting system so no unsightly grub screws. Interchangeable metal piano black finish gear pattern top inserts.